Get glass bottles delivered to your home or office. You asked for it; we responded. 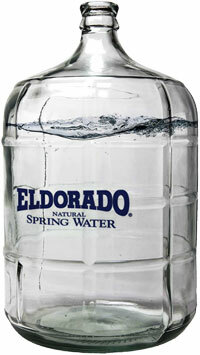 Due to requests made by Eldorado customers, we are now offering our natural spring water in 3-gallon glass bottles in addition to our current plastic bottles. Glass bottles are available for delivery. Recycled plastic, or RPET (recycled polyethylene terephthalate) bottles are engineered to utilize plastic waste, which otherwise could end up in landfills. 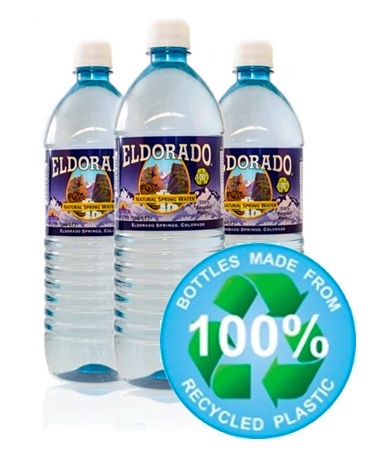 The RPET plastic used in Eldorado’s new bottle is FDA approved and meets the same rigorous safety standards as virgin plastic bottles. While turning a used plastic bottle into a clean, reusable bottle requires energy and emits carbon, using 100% RPET versus virgin plastic significantly reduces both. Specifically, Eldorado will reduce the energy required to produce its RPET bottle by 77% and reduce its GHG Emissions (Carbon, Methane and Nitrous Oxide) by 58% according to NAPCOR (North American for PET Container Resources). Eldorado’s manufacturing facility in Louisville, Colorado obtains 50% of its energy needs from the rooftop 100 kilowatt solar electric system, which was installed in September 2009. 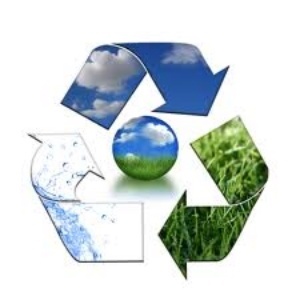 Operationally, Eldorado recycles 96% of waste from its plant, including paper, cardboard and plastic. Eldorado is Colorado Proud! We work hard to be available to our customers. We only service the Rocky Mountain region and make ourselves available via email, phone, fax, social networking (Facebook & Twitter), as well as through forms on our website. 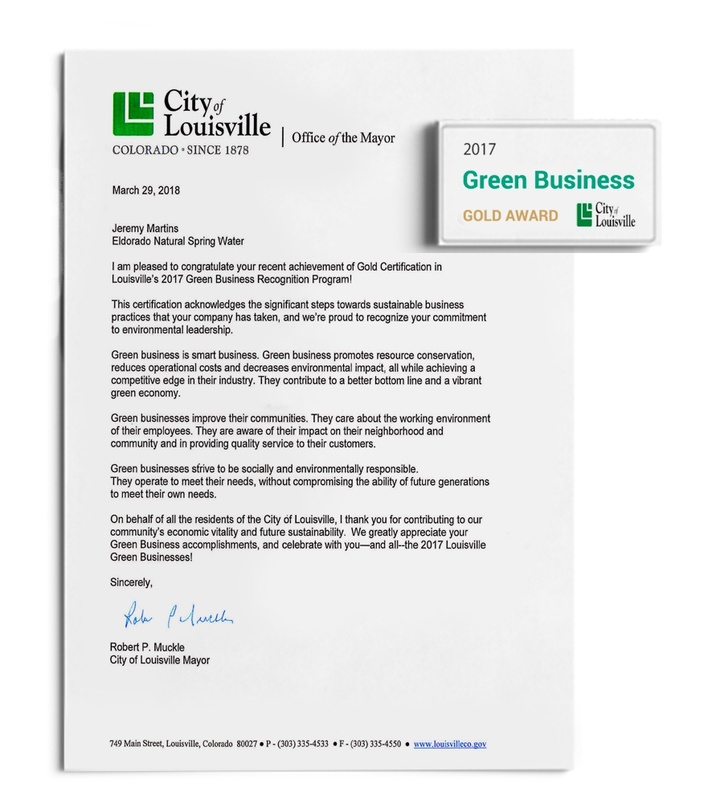 Maintaining local excellence is our benchmark of success! 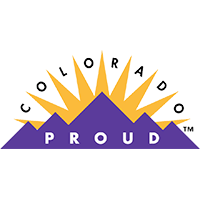 Find out more about what it means to be Colorado Proud. 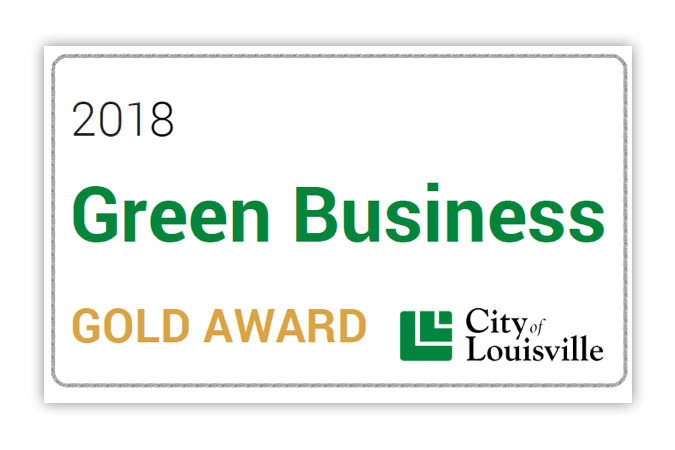 We were recently honored to receive the Gold Award from the Mayor of Louisville, CO, recognizing us for our green business practices. 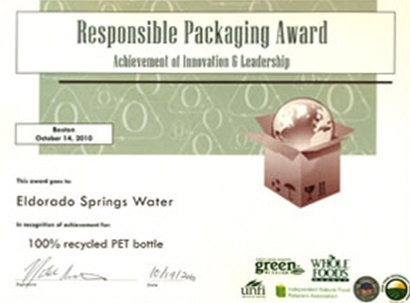 Eldorado Natural Spring Water was awarded the Responsible Packaging Award in October 2010 for innovation with PCR (post-consumer resin) bottles. We're not just winning awards for packaging. 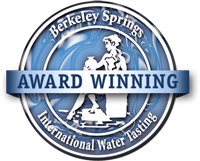 Did you know Eldorado's water is award-winning also?